Could dipping electrodes in a secret sauce improve supercapacitor and battery endurance and power? Could coating cell internals be the flavor of the month? These recipes for better batteries may improve things at a better than normal rate, if California researchers have anything to say about it. Working with his compatriot Dr. Jaephil Cho in South Korean, Dr. Cui of Stanford University has been a leader in developing improved battery technology, even developing a painted paper battery. In an appearance at the 2009 Electric Aircraft Symposium, Cui explained a basic truth of battery development – that improvements generally created about eight percent greater power or endurance in cells every year, leading to a doubling of battery capabilities every seven and one-half years. He aims to improve that rate of change in batteries and ultracapacitors. Although ultracapacitors are able to charge and discharge rapidly, they are only about one-tenth as energy dense as batteries of equivalent mass. Cui and colleague Zhenan Bao have attempted to increase the surface area of electrodes by using graphene and carbon nanotubes, which expose a lot of surfaces in their honeycomb-like structures. Carbon nanotubes are still a bit pricey, though, leading Cui and Bao to create composite electrodes made of carbon nanotubes and magnesium oxide, an abundant and inexpensive alternative to higher-cost spreads. Others, including Lu-Chang Qin of the University of North Carolina at Chapel Hill, think this is “an important advancement,” with hopes for “a new generation of supercapacitors,” but points out that the Stanford researchers have yet to measure the energy density of their new electrodes. Bor Jang at Nanotek Instruments thinks the “a combination of graphene, MnO2, and a conductive polymer or carbon nanotubes might be overkill,” and still lack the necessary energy density. 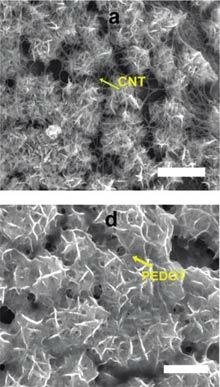 In another approach, Dr. Cui had discussed the flexing that takes place inside batteries as they charge and discharge. In some cells, this physical expansion and contraction leads to physical and electronic failure. Gao Liu, a researcher at the Berkeley Lab’s Environmental Energy Technologies Division, has been experimenting with an inexpensive coating that would resist this flexing and prolong battery life. Liu describes graphite electrodes as acting like a sponge in soaking up lithium ions while holding their shape. The more ions the electrode can attract, the more powerful the battery can be. Silicon is highly attractive for this reason, and is able to hold onto 10 times the ions graphite can attract. But its constant change in volume, up to four times its normal size during charging, eventually creates gaps which do not allow the flow of electrons. There needs to be a way to contain this flexing. Dr. Cui has one approach he is working on with Amprius, a commercial enterprise with which he is working. By “growing shaggy arrays of silicon nanowires that can bend, swell, and move around as lithium enters and exits,” the anodes can survive all the swelling. This approach, though,” requires new processes that aren’t normally used in battery anufacturing,” according to the MIT report. Liu’s research showed that others were making a “fatal mistake” in using coating materials that lost their conductivity when used in conditions that also crippled anodes – not much of a help, really. Working with materials scientists, Liu found polymers that would enhance conductivity, rather than emulate the failings of the anodes. Having found the proper material, they made it stickier, and tested it using conventional manufacturing techniques. Dr. Liu is working with 3M Electronics to find a commercial application for his research. If such techniques can provide a better recipe for battery success, we may be benefitting from the commercialization of these breakthroughs in a hoped-for near future, rather than peering into that five-to-ten year tunnel that seems to forever constrain progress.